In a time when you could count female Metal outlaws in one hand this drastic lady was making here first appearance in the Heavy Metal map. Doro Pesch cut her teeth in German traditional metallers WARLOCK in the second half of the 80s and has since then developed her own solo career; and much more we should add: personality, vocal style, attitude and nearly everything that becomes an artist’s trademark imprint. Not willing to e.g. judge if this album is better than that one or not it still is essential to say that artists like Doro Pesch (and GIRLSCHOOL and Leather Leone and Sabina Classen, I can recall now) handled all the male criticism and virtually opened every gate for female singers and musicians to expose and develop their skills and musical hunger. And this – I think – counts the most. The blonde German lady had already celebrated a 20th anniversary in 2003/2004 (resulting in the release of the “20 Years A Warrior Soul” DVD/CD) but this gathering was even more organized and spectacular; at least that’s what you get if you focus on Disc 1 of the DVD/CD set. Nearly 2 ½ hours of energetic performance with enough songs from both her solo career and WARLOCK days becomes sight for sore eyes while the stage antics (including the gigantic magician muppet, fires and even cheerleeders) and the setup leave limited questions for further analysis. And then it’s the guestlist which is as rich as you cannot even envision: check the tracklist below and imagine even Tom Angelripper or Alex Krull stepped onstage during “All We Are” to applaud Doro’s charisma and illustrious history. In terms of music, the show flows quite easily since the vibe is so strong putting everything in place. It should be noted that minor mistakes were not erased giving a sense of originality to this celebration, while – if there’s no overdubs here – the crowd’s roar ties more than well with the solid musicianship of the band. The variety in the guestlist confirms Doro’s celebration was something more than just a musical gathering and there are times – like when the 1986 WARLOCK lineup stepped onstage for a couple of oldies or during the all-sing-along part in “All We Are” – were you’ll probably get quite emotional if you always followed and appreciated Doro’s 25-year hard work. The second disc features a 75-minute documentary concerning everything that happened prior and during and after that glorious evening. It’s a rich collage of Doro’s impressions, quotes from people that worked for this event plus words from the majority of the German singer’s guests (plus overseas friends that could not make it to the gig – Lemmy and SAXON included). More goodies include footage from various festival appearances Doro did make the last years plus extra road footage and fan candy for the die-hard aficionado. Taking place at her hometown, Düsseldorf, this 25th anniversary does not add any proof to Doro Pesch’s value; that’s not needed and is not the purpose anyway. “25 Years In Rock” stands alone as a vivid full DVD combo but also points out the kind of atmosphere a classic Metal artist can evoke backed by all these years of singing career. 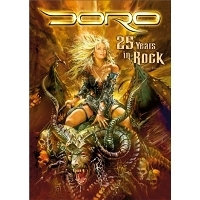 I think Doro has released a fair amount of visual bliss all these years but this 2010 release tops anything else. I’d really like to read the biography of this woman at some time in the –not so distant – future. Till then, enjoy this DVD and do not even think it’s not value for money. Yeap, this lady proudly kept the flag high in December 13th, 2008.